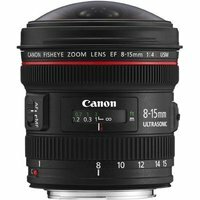 The Canon EF 8-15mm f/4L Fisheye USM is first fisheye zoom lens offering a choice of full frame or circular image. It is a full frame fisheye lens for cameras with 35mm, APS-H or APS-C sensors plus circular fisheye option for cameras with 35mm sensors. High quality images are delivered by an UD lens and an aspherical lens. It features a reduction in ghosting and flare with SubWavelength Coating (SWC) and super spectra coating.